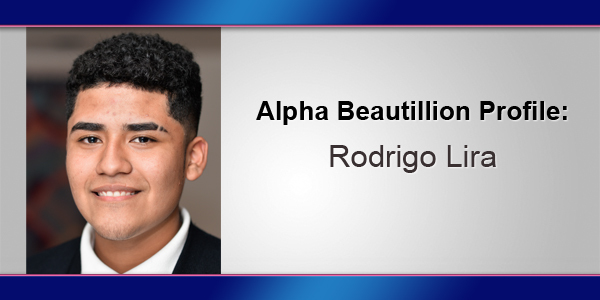 In the fifth in a series of profiles of the young men competing in this year’s Alpha Beautillion, we spotlight Rodrigo J. Lira from the Mount Saint Agnes Academy. Rodrigo J. Lira was born on February 28th in the capital of Peru, Lima. He is the son of parents Elizabeth Lira and Ruben Teuling and has two younger sisters named Jocelyn and Samantha. Since he was little, the morals of “family first” were introduced to him and remain with him as a key part of his life to this day. Throughout his school journey in Peru, Rodrigo always gave it his best. Moving to Bermuda in 2013 opened up a whole new world of opportunities to Rodrigo. He joined Mount Saint Agnes just two weeks after arriving on the island and he fit right in with his peers. English being his second language did not stop him from reaching great heights both academically and socially. He received Honors in his first year of school in Bermuda and has not stopped since. One of the things Rodrigo enjoys the most is participating in group and community projects. He helped kick start the Middle School Student Council and became class captain. He has been an active participant of the Yearbook Club since Grade 9 and was selected to join the National Honor Society based on his academic achievement, and leadership role within the school and community. Rodrigo currently holds the position of President of the National Honor Society and Vice President of the Student Council. Community Service is a key part of Rodrigo’s life. He believes there is a self reward in helping the ones in need. Rodrigo’s idea of community service is “do unto others as you would have them do to you.” He has helped in school through the Christmas Concert, Summer Camp, Homework Tutoring Club, Youth Mentoring and many other events. He is also an active participant of the Loaves and Fishes program which feeds meals to those in need, and helps as an instructor for the Project Ride Program. Matilda Smith Rest Home was a service opportunity introduced to Rodrigo through the Beautillion that he has really enjoyed. Art has always been a part of Rodrigo’s life. His interest in drawing was discovered from a very early age and his artistic ability was expanded when he moved to Bermuda by being able to use different mediums. Rodrigo received the second place award for the Mirrors Art Competition in 2017 and was honored to be nominated for the 2018 Outstanding Teen Awards in the category of Visual Arts. Rodrigo knew early on that the career he wanted to pursue in the future had to include art and creativity. Architecture caught his attention in Grade 10, and he had a shadow day experience in 2016 and a job experience course during his first semester of his senior year at Botelhowood Architects. Rodrigo is very grateful he had the opportunity to experience what architecture was like and knew that this was what he wanted to pursue as a career. Rodrigo hopes to attend University in Canada to study architecture. The Alpha Beautillion is a “Rite of Passage” Ceremony where top high school male students demonstrate their oratorical ability, talent, and community service activities as they compete for scholarships, with a bursary prize of $5,000 awarded to the top male and smaller monetary awards given to all other participants. 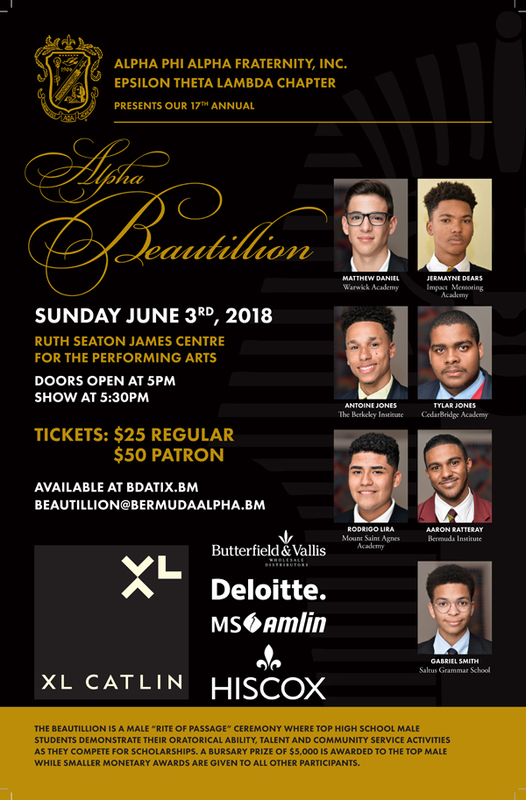 The 17th Annual Alpha Beautillion will be held on Sunday June 3rd at the Ruth Seaton James Auditorium, with regular tickets costing $25 and patron tickets costing $50. Tickets are available at bdatix.bm, and for more information please email beautillion@bermudaalpha.bm. For all our coverage of the Alpha Beautillion click here. My dear son. We love you so much, you make us very proud! God keep blessing you and keep guiding your path to pursue your dreams. Love you with all of me.